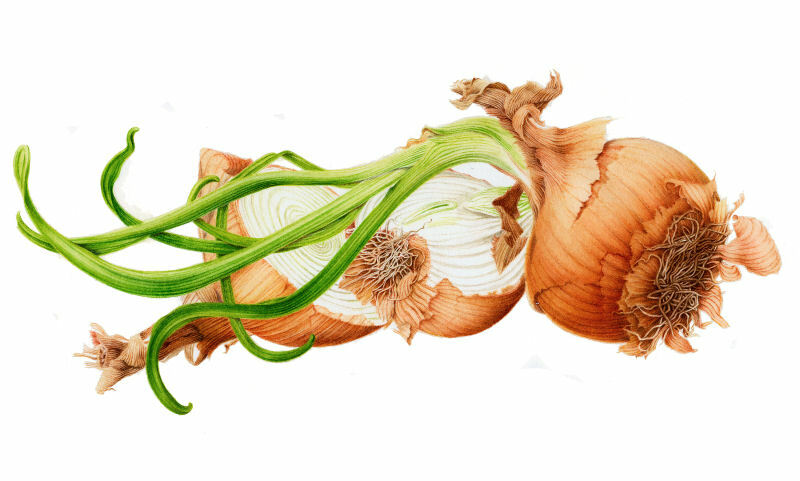 The genus Allium, from the Latin for garlic, includes several pungent bulbous plants, commonly called onion. Allium cepa is also known as the “garden onion” or “bulb” onion, related to wild species found in Central Asia. Bulbs from the onion family have been a source of food for millennia. Traces of onion remains along with fig and date stones have been found in Bronze Age settlements, dating back to 5000 BC, although it is more likely that the cultivation of onions occurred two thousand years later. And much more recently, on his 1492 expedition to Hispaniola, a certain Mr. Columbus introduced the plant to North America. In ancient Egypt the onion’s spherical shape and concentric rings represented eternal life and were used in burial rites. Athletes in ancient Greece trusted onions to balance their blood; in Rome gladiators used onions to firm up their muscles. Over the centuries they have been prescribed for a host of folk remedies: the relief of headache, cough, snake bite; prevention of hair loss infertility; heart disease, diabetes, osteoporosis; the healing of wounds and removal of skin blemishes; the facilitation of bowel movement and penile erection. Yet in India certain sects proscribe the eating of onions precisely because of its reputed aphrodisiacal potency! Onion flowers, leaves, bulb and seeds are all edible. Bulbs are eaten raw, pickled, used as a garnish or flavoring and cooked in numerous ways, from caramelized to curried, in sauces or in stews. But the onion exacts a price for its use. When you crush, chop or slice an onion, you cause cellular breakdown which triggers a chain of chemical reactions. First, the release of Alliinases (enzymes) generates sulphenic acids which in turn rearrange into a volatile gas that irritates your eyes and stimulates your lachrymose glands until you finally end up in tears!